Facebook has been hit with a lawsuit accusing it of bilking advertisers by inflating the number of people its ads could reach. 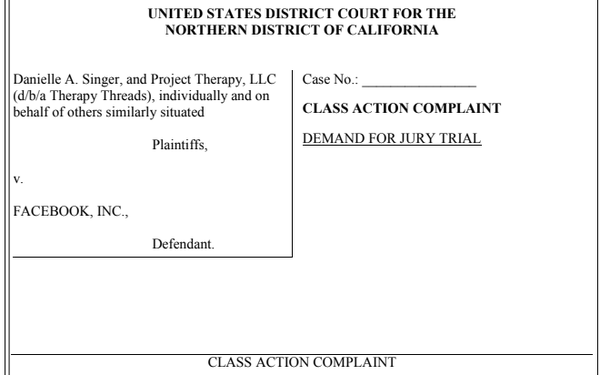 "Based on publicly available research and plaintiffs’ own analysis, Facebook overstates the potential reach of its advertisements," business owner Danielle Singer alleges in a class-action complaint filed Wednesday in U.S. District Court for the Northern District of California. Singer, who owns the Kansas-based business Therapy Threads -- which sells aromatherapy-related products -- says she spent more than $14,000 on Facebook ads between October of 2013 and April of this year. She alleges that Facebook induced advertisers like herself to purchase ads -- and to pay higher prices for them -- by "vastly" inflating the number of active users the ads could reach. The complaint claims that Facebook violated a California business law. The complaint draws on reports by outside groups, including the industry organization Video Advertising Bureau, as well as a survey commissioned by the plaintiffs. The Video Advertising Bureau reported last year that Facebook's estimates of audience reach in every U.S. state were higher than the states' populations according to the U.S. Census Bureau. Singer specifically refers to Chicago in the complaint. She alleges that Facebook claimed in 2017 that its ads could potentially 1.9 million people in Chicago between the ages 18 and 34, but that Census data showed a population of only 808,785 people in that age range in Chicago. Singer adds that a survey she commissioned shows that 59% of 18- to-34 year-olds in Chicago have Facebook accounts. The upshot, she alleges, is that Facebook ads potentially reach only 500,000 18-34 year-olds in Chicago. The complaint also draws on information allegedly provided by ex-Facebook employees. One of the former employees, identified in court papers as "Confidential Witness 1," said the company's "potential reach" statistic is "like a made-up PR number," according to the complaint. Another ex-employee, "Confidential Witness 3," allegedly "stated that Facebook was not concerned with stopping duplicate or fake accounts in calculating potential reach." Singer is seeking monetary damages, as well as an order requiring Facebook to hire outside auditors and to remedy any problems found by the auditors. Facebook hasn't yet responded to MediaPost's request for comment. But last year, the company said its reach estimates were based on many factors, and were not "designed to match population of census estimates." The company is still facing a separate lawsuit over allegations of inflated video metrics. That earlier matter, which dates to 2016, is pending before U.S. District Court Judge Jeffrey White in Oakland, California.